Enjoy the great outdoors this summer! Here are some awesome fun outdoor activity ideas that will keep your kids busy and cool in the hot summer. What can be better than keeping all the mess outside?! Great for all ages, moms and kids will love these ideas. Aim: Children need to swing across the monkey bars without popping or dropping any of the water balloons in the way! Now let the children line up and try the challenge. If the balloons fall or pop, it'll give everyone a great cool shower! Instructions: Trace a circle on the inside of the box and cut it out with a razor knife. 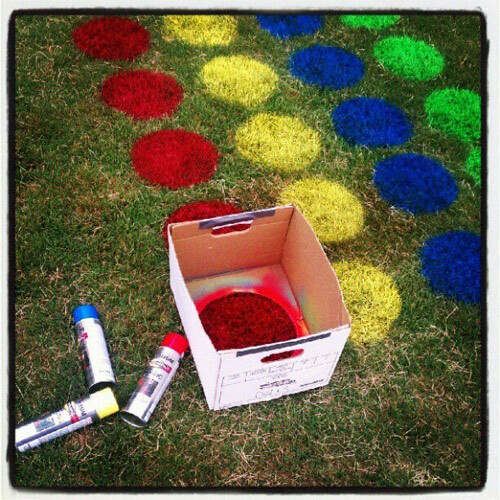 Place the box on the floor in your lawn and spray within the circle. Keep moving the box template to create more circles. Continue until you have 4 or 5 rows of about 6-10 circles each. 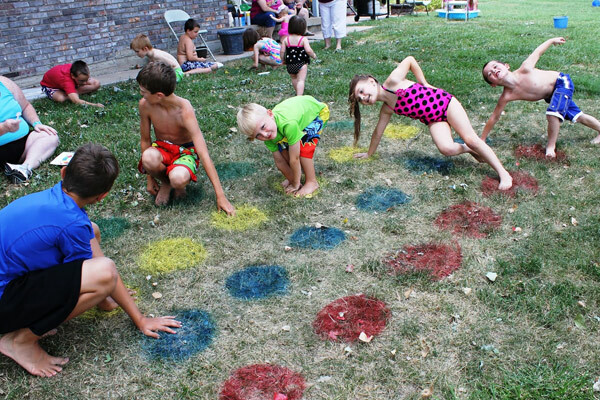 Gather a group together and start twisting! Practice throwing, aiming, and scoring! 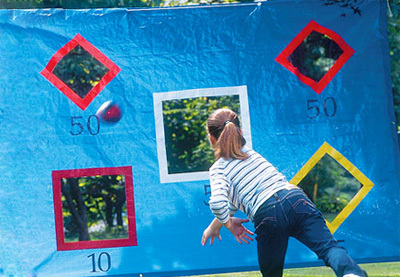 All you need to do is hang one of those plastic fabric storage covers in your yard. Cut out some shapes and mark them with different scores. Set a starting line and let them aim! 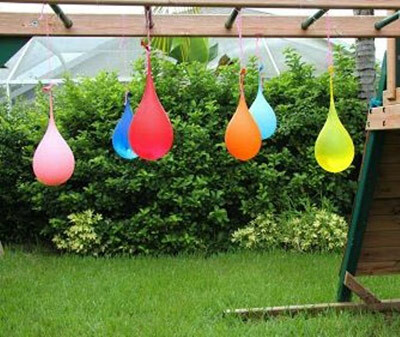 Game can be played with water balloons, beanies, or balls. 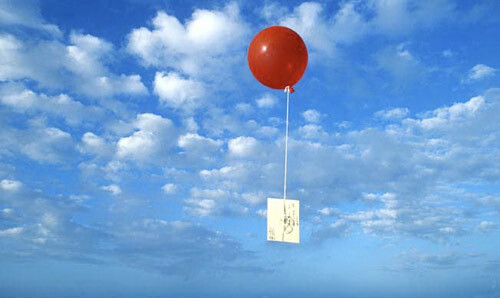 Write a letter and attach it to a helium balloon. Make sure to write your contact info because you may get lucky and get a letter back from the person who finds your balloon. You never know how far balloons can travel and where they'll land up! This is a fun and creative activity that your kids will greatly enjoy! What a funny activity! 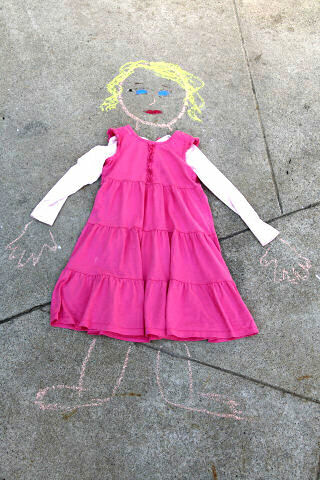 Your kids will have a good laugh as they create a doll dressed in their clothing on the floor. Let them choose an outfit from their closet and place it on the sidewalk. With some colored chalk, have them use their imagination and draw a face, hands, and feet. Don't forget to photograph them laying beside their creation. Use one of these ideas and SUBMIT your photos. Our team will choose a winner that will receive a $50 aBaby gift certificate. Photos can be submitted until August 20 2014.